Prime Minister Thongloun Sisoulith, please accept my sincere congratulations on your successful chairmanship of the ASEAN throughout this year. You guided us with the timely motto of “Turning Vision into Reality for Dynamic ASEAN community.” You ably did your part in deepening integration to move us towards the realization of a rules-based people oriented, people-centered ASEAN community. In the last two days of our meetings, I have benefited immensely from our discussions and exchanges, providing me with insights on how best to build upon Lao PDR’s efforts in community building. During the Philippines’ chairmanship, we will highlight ASEAN as a model of regionalism and a global player, with the interest of the people at its core. 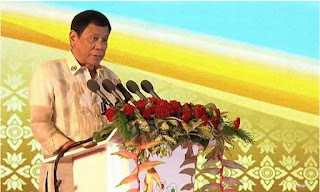 We will pursue initiative and enhance cooperation with global partners to ensure that ASEAN citizens live in peace, stability, security and growth, all the while remaining ASEAN’s centrality, unity, and solidarity, we will maintain for all times. The Philippines is ready and willing to steer and guide the association. But crucial to the realization of our goals is the cooperation and support of all ASEAN member states and our dialogue partners. Towards this end, I invite you to be our dynamic and vibrant partners as we guide ASEAN in 2017. Our theme, “Partnering for Change, Engaging the World,” captures our resolve to consolidate our community for our peoples with a sense of togetherness and common identity, ready and able to take our rightful place in the global community of nations. The Philippines’ ASEAN chairmanship coincides with a historic milestone event, we will celebrate the 50th anniversary of the founding of our association. It will be an occasion for us to set the tone for the next 50 years. Join us in making the commemoration of ASEAN’s 50th anniversary a success. With great honor and humility, I accept the chairmanship of the ASEAN from our excellent host, the Lao People’s Republic... Democratic Republic. I look forward to seeing you all in the Philippines in 2017.